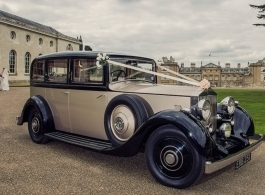 A magnificent example of a vintage Rolls Royce wedding car. This 1937 Rolls Royce has been painstakingly restored and is in superb condition both inside and out. The Champagne Gold colour of the exterior is a beautiful contrast to a White wedding dress and will look excellent in your wedding day photos.